We’ve written before, with our tongue partially in our cheek, about how many times you should shoot the bad guy when you’re forced to defend yourself. Let’s revisit the subject, and this time from a more scientific attitude. We promise not to make any more snarky comments about police officers shooting at a guy 71 times (and hitting him 60 times) and definitely we don’t suggest that should be your objective, either, even if only for the reason that very few of us carry 71 rounds with us. I sometimes have 61 rounds with me, but never 71, and absolutely would never expect to use more than a small percentage of those rounds in an exchange with a single adversary. Indeed, just to set the scene realistically, most gun fights occur at a range that is much to close for comfort, and with insufficient warning. You’re starting off at a tactical disadvantage, and – perhaps because of that – are forced to desperately try and regain control of a bad situation. The ‘rule of threes’ is sometimes quoted. This suggests that most gun fights occur at a distance of about 3 yards (or less), last about 3 seconds (or less), and involve about three shots fired (or more). What about a Warning Shot First? Do not fire a warning shot. That bullet is going to go somewhere. If you fire it down into the ground, it might ricochet off the ground and go in who knows what direction – even maybe directly back at you. Even if you are shooting into dirt, for all you know, there’s a huge rock half an inch under the dirt. If you fire it up into the air, well, guess what. What goes up must come down again, and that bullet is going to plunge to earth at about 300 mph (450 ft/sec) – fast enough to do appreciable damage if it hits a person or property when finally reaching the ground. Hopefully you have already given a verbal warning/command in a very loud voice (not only so you are sure the bad guy has heard you and realizes you are serious, but also so any other nearby people can testify they heard you warn the bad guy away) such as ‘Stop!’ or ‘Go Away!’, followed by drawing your pistol and a ‘Stop or I Shoot’, followed by sighting in on the person. At this point, the person has been verbally warned, and also sees you have a gun pointed at them. If that isn’t enough to make them turn away, a warning shot won’t add any more force to your request. It might endanger you or some other person, and it pre-occupies you with something that might allow the attacker to close the distance and get into contact with you. Where Should You First Aim? 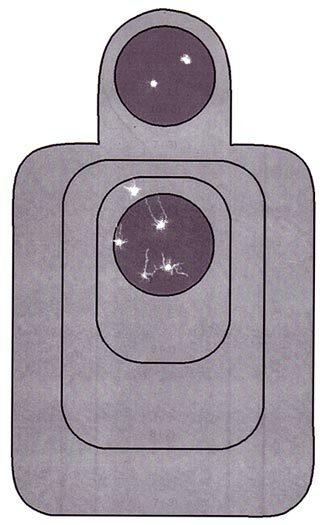 Assuming you have a clear view of the bad guy, your first shots should be aimed into the attacker’s chest. It is the biggest and easiest target to hit, and also a moderately vulnerable part of the bad guy’s anatomy. This is sometimes referred to as their ‘center (of) mass’, and because it is the biggest part of their body, you can aim into the middle of it, and still hit them even if you miss the exact center by a reasonable margin. It goes without saying that in the stress of the moment, you’re not going to be shooting as accurately as on the range. Of course, if the person is obscured by something, you’ll have to redefine the appropriate ‘center of mass’ based on what you can and can’t see/shoot at. Better shooting schools teach you not just to shoot into the center of the person’s torso, but instead into the center of their thoracic cavity, which can be considered as the center of their upper chest – where the lungs and heart are. Shots into this area may have a more rapidly disabling effect. Which brings up the essential issue of what to expect when you get rounds on target – ie, when you are hitting the bad guy with your shots – and how many times you’ll need to shoot him to get him out of the fight. How Many Shots Does it Take? As (nearly) always, the movies get it wrong. Forget everything you’ve ever seen in the movies, and on television. When you shoot a bad guy with a pistol, almost certainly, there are three things which you might expect to happen (based on the movies) but which will not happen. The first thing is the person isn’t going to immediately collapse, all movement stopped, instantly dead. Quite the opposite. 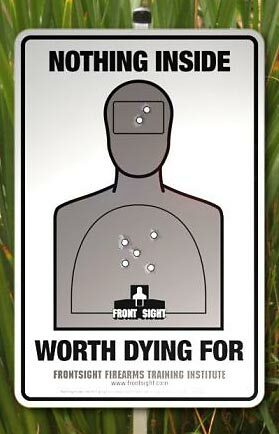 The probabilities suggest that he may likely not react at all to the first shot hitting him. Indeed, some people go all the way through a gun fight and only subsequently discover they’ve been shot. Good trainers teach their students at the end of an encounter to check themselves all over for wounds, because in the heat of the moment, they might not even realize they’ve been shot. The second thing is the person isn’t going to fly through the air ten feet backwards. He probably won’t be knocked about much at all – the ‘best case’ scenario is that the bullet is hitting him with no more momentum than the recoil you experienced when you fired your pistol milliseconds before. The recoil didn’t force you off your feet, and it will have the same or less effect on the person the bullet hits. The third thing is that blood isn’t going to suddenly and dramatically start spurting out of the person every which way. Indeed, assuming the person is wearing a couple of layers of clothing, you might not notice any evidence of the bullet having hit them at all – no blood, no big hole, nothing. So put these three things together. The person doesn’t collapse or move at all, and you don’t even notice a bullet hole or blood after firing your bullet. Goodbye, Hollywood. And welcome to the real world! In other words, you probably can’t tell if you hit the person or not – and even at very short ranges, you’re as likely to miss as hit (there’s a classic situation of a gun fight in an elevator between a law enforcement officer and a bad guy, with over ten rounds fired and neither person being hit by any of the rounds). Even in the very unlikely event that all your rounds are landing on target, the sad truth is that pistol rounds, no matter what their caliber, or what the bullet type, are woefully inadequate and are most unlikely to solve your problem with a single generic hit to the center of the thoracic cavity. So it is recommended practice that you shoot at least twice at/into the center of the thoracic cavity. Maybe one of the two shots missed entirely. Maybe one was a ‘lucky’ shot (depending on if you are the attacker or defender) and one was not. Indeed, while you don’t want to consciously shift your point of aim, it is a good thing if the two rounds land into different parts of this zone, so as to spread the disruptive effects over a broader range of body parts. But what next? That depends on the bad guy. Is he still posing a threat – is he still coming towards you? Or did he collapse, perhaps even out of panic and fear and surprise? Did he surrender to you? Did he turn tail and run away? If the immediate threat has stopped, you must stop shooting. You no longer have any legal justification to shoot at the person now they are no longer an immediate imminent threat. But if the person is still coming at you, then you need to keep on solving the problem. Continued Shooting at the Thoracic Cavity? If the bad guy is still some distance from you (but not too far, of course, or else they may not be sufficiently a threat to justify shooting in the first place unless they have a weapon) then you probably have time to fire a few more shots into their thoracic cavity. Maybe either or both of your first shots failed to hit him entirely, in which case maybe some additional shots will actually land on target. Unless your pistol bullet travels through the thoracic cavity and severs the bad guy’s spine, it will not immediately incapacitate your attacker (note that high velocity rifle rounds more commonly have a very much greater immediate effect). Even if the bullet goes through the bad guy’s heart, it will take some measurable time for the guy to lose sufficient blood pressure and bleed sufficiently out to cease to be ‘in the fight’. How long? Best case scenario – perhaps 30 seconds. Worst case scenario – many minutes (assuming that he doesn’t survive the encounter completely, even after taking multiple hits). Some people will collapse in a type of faint from the shock and surprise of being hit. This is a ‘false’ collapse – it is mental rather than physical, and when they come to, they might re-enter the fight. That’s not to say you should shoot someone when they’re on the ground and not moving! But you need to watch a person very carefully after they go to the ground. They might be just pretending to be incapacitated, and might surprise you as soon as they feel it tactically advantageous. Other people – especially if on drugs – will not be slowed at all, even by hits that will cause their certain death in only a few minutes. The drugs have in essence disconnected their brain from their body, and their brain doesn’t even realize they’ve been hit, so their body keeps responding to the brain commands as best it can. Lastly, and probably the least likely scenario, maybe the bad guy is wearing some type of body armor. Bullet proof vests can be legally purchased by civilians, and do a very good job of preventing pistol bullets from penetrating through the vest and into the person wearing them. Don’t forget, of course, that all these reasons why your shots aren’t stopping the bad guy from continuing with his attack are also assuming that your rounds are landing on target. Chances are some/many/most of them are misses – even trained police typically miss more often than they hit when in a gunfight. That’s why you shoot at least twice into the center of mass. So, you’ve fired your gun you’re not quite certain how many times at the bad guy, but he continues to press his attack and is getting very close to you. This is where you have to switch targets. For whatever reason – and it is irrelevant why – your center of the thoracic cavity shots aren’t stopping the attack. Time for your ‘Plan B’. You need to now switch to head shots. A bullet in the brain is the most certain way of quickly stopping any attacker – big or small, on drugs or not, and with or without a torso protecting bullet proof vest. We don’t recommend your first shot(s) should be to the head for the simple and obvious fact that the head is a smaller target than the chest, and is likely to be moving rather than standing conveniently still. It is also less ‘politically correct’, and as unfortunate as this is, you need to be sensitive to how the police and potentially a jury (as well as friends, neighbors, and reporters) will respond to the circumstances of your use of deadly force. But if the body shots didn’t work, and particularly if the person is getting closer, thereby also making their head a larger target, you have no choice but to switch to head shots in what is sometimes referred to as a ‘failure to stop’ drill. Don’t just shoot anywhere on their head. Much of the head has its own armor plating – the skull and jawbone in particular. So you want to aim from sort of the eye brows down to the bottom of the nose, and from side to side in line with the outer sides of the eyes – about a 3″ x 5″ card sized target. Sure, it seems even more distasteful to shoot at a person’s head, but – hey! You didn’t start this fight, the other guy did, and he refused every possible opportunity to end the confrontation; indeed, by the time you switch to head shots, the guy has even continued his attack notwithstanding you shooting into his chest multiple times. There’s no time to be squeamish or hesitant, you need to be at least as determined and certain as your attacker is proving to be. How high is up? How long is a piece of string? And – oh yes, another question with no certain answer – ‘how many times should I shoot him in the head?’. The answer should be obvious – until he stops. Until he ceases to be a threat to you. The good news is that this is probably going to require only a single shot, but the downside to a head shot is that it is a smaller target, and you might miss, so don’t fire a single shot, then relax and assume the game is over. Fire a single shot, bring your pistol immediately back on target, and shoot a second time, unless the guy is collapsing in front of you. Continue repeating until your gun runs dry or the bad guy stops. How About A Kinder and Gentler Approach? Shooting to Incapacitate? One of the great things about the internet is that we now get a chance to see how many people react and respond to news of a shooting. Many newspaper websites have the ability for readers to post comments alongside the news stories they publish, and for sure, whenever there’s a story of a shooting (usually the police shooting a bad guy) you’ll see plenty of comments (most commonly from ‘armchair experts’ who have never held a gun in their lives) suggesting that the police should have shot to ‘shoot the gun out of his hand’ or in the foot, ankle, or knee, so as to cause the guy to collapse and no longer be able to move towards the policeman. Slightly more knowledgeable people will suggest shooting at the person’s pelvic girdle, causing them to fall over. These are well intentioned people (who may well become jurors, so it is relevant to understand how uninvolved people react to shooting situations) but their suggestions are dangerously naïve and impractical. Your desperate struggle will be at a too close range, in a position where you probably do not have any sort of strategic advantage or time buffer up your sleeve, and you are confronting the imminent probability of the bad guy attacking you, grievously wounding you, and possibly killing you. You don’t have the time to try for some trick circus style feats of marksmanship – target shooting of a level you probably could not achieve on a calm day with no time or situational stress acting on you at a range with a static target, let alone in a dark alley late at night with the bad guy rushing towards you. If the situation has got to the point where you need to use lethal force to stop a threat, and that is a lawful act on your part, then you need to do exactly that. Your prime concern is stopping the threat and saving yourself. The only effective way of doing that is shots to the center of mass, possibly followed by shots to the head. Anything else is giving the bad guy a ‘bonus’ card in the match. And there’s no law or moral justification for making it easier for him to win and you to lose. Kinder and Gentler Part 2 : Shooting to Wound? A close cousin of the ‘shoot to incapacitate’ theory is the ‘shoot to wound’ theory. But follow the ‘logic’ of this thought process through carefully : ‘The bad guy was frightening me, threatening me, in some way harming me, but he didn’t really deserve to be killed; so I just shot him in the leg/arm/whatever’. If you say this to the police, you’ll not be hailed as a hero. You’ll be locked up and charged with unlawful use of deadly force, and your own statement in the preceding paragraph will be the statement that guarantees your conviction and the extended jail term that follows. Think through what you just said. To paraphrase, you said ‘The situation did not justify using deadly force, but I used deadly force anyway, albeit in the hope that the deadly force wouldn’t be fatal’. Guns don’t have dials on them that you can set to ‘mild’, ‘medium’, or ‘full’. While we were talking before about how the chances are that a single shot won’t kill a person, there is also a chance that a single shot might. A bullet could hit an artery, sever a nerve cluster, or whatever else. Even if a single shot doesn’t kill the person, it might grievously incapacitate them for years or the rest of their life, and it might cost millions of dollars in hospital care and ongoing at home care for the rest of their lives (costs that you might end up being liable for). You never shoot to wound a person – but you also never shoot to kill them. All you do is you shoot to stop the threat they pose. Never say ‘I realized I had to kill the guy’, because that’s a faulty realization. The only thing you realize is that your life is being directly and credibly threatened, and that you have no other way to protect yourself than to use your firearm to stop the threat being presented at you. The threat will end when the bad guy surrenders, runs away, or falls to the ground. Living or dying (or wounding or incapacitating) has nothing to do with it. So – the Bottom Line? If and/or when you end up in an extreme situation with no alternative but the lawful use of deadly force, first shoot at least twice into the attacker’s central thoracic cavity. If this does not end their attack, transition to head shots into the center of their cranial ocular cavity. Only stop shooting when they’ve ceased to be a deadly threat to you. Something to Keep Secret When Carrying Concealed Will Any Gun Do In a Gun Fight?